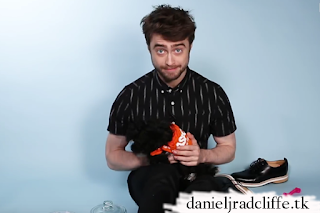 You might remember that BuzzFeed asked you for your burning questions for their next interview with Daniel which is the puppy interview. It's now online, and you can watch the video below to see if your question has been answered. You can see more photos on this site's Facebook page. Subjects are: Harry Potter, social media, karaoke, Elijah Wood, Broadway and more. Update: 10th October 2018. Elijah Wood responded to the question "When are you and Elijah Wood finally going to do a project about brothers or mistaken identity?" on Twitter. He said: "totally down for a duo flick!". The puppies featured in the video are from the ASPCA (American Society for the Prevention of Cruelty to Animals). If you want to help find them a home go to aspca.org/findyourfido.